Popov, V. L. Kontaktmechanik und Reibung. Ein Lehr- und Anwendungsbuch von der Nanotribologie bis zur numerischen Simulation. - Springer-Verlag, 2009, 328 S., Softcover, ISBN: 978-3-540-88836-9. First English Edition: Popov V.L. Contact Mechanics and Friction. Physical Principles and Applications. 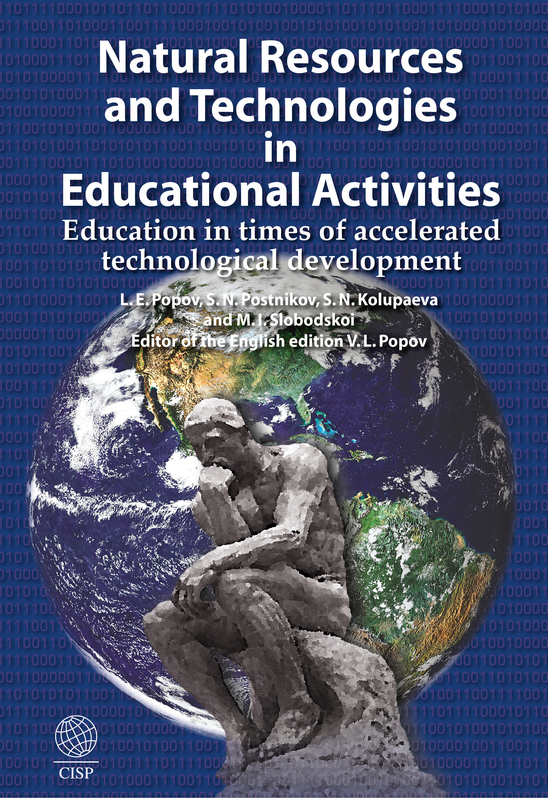 – Springer-Verlag, 2010, 362 p, ISBN: 978-3-642-10802-0. 42133015. First Chinese Edition: 接 触力 学与摩擦, 物理原 理及应 用, Beijing: Tsinghua University Press, 2012. First Russian Edition: Попов В.Л. Механика контактного взаимодействия и физика трения. От нанотрибологии до динамики землетрясений. Moscow: Fizmatlit, 2013. 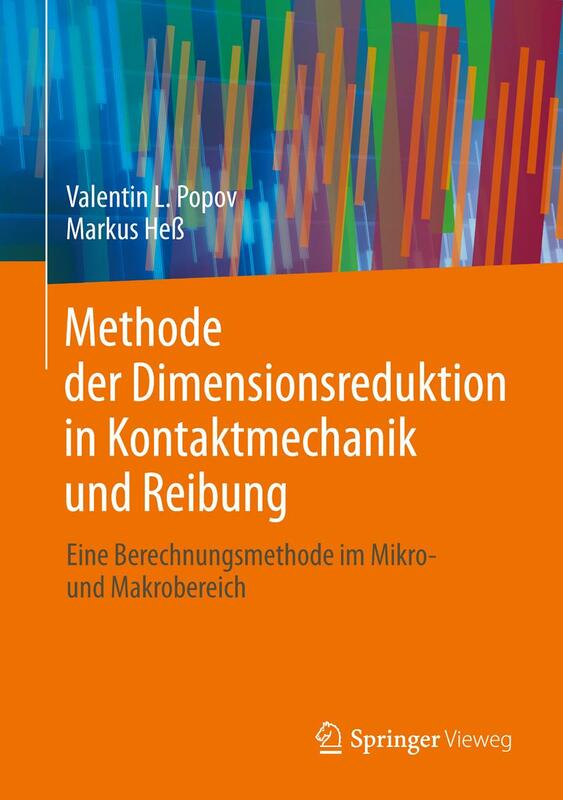 Popov, V.L., Heß, M., Methode der Dimensionsreduktion in Kontaktmechanik und Reibung. Eine Berechnungsmethode im Mikro- und Makrobereich, Springer, 2013, ISBN 978-3-642-32673-8. Popov V.L. and Filippov A.E. Directed molecular transport in an oscillating channel with randomness. - Phys. Rev. E. 2008, E 77, 021114 (5 pp). Popov V.L. Nanomachines: Methods to induce a directed motion at nanoscale. - Phys. Rev. E., 2003, v. 68, Art. No. 026608. Popov V.L. Nanomachines: a general approach to inducing directed motion at the atomic level. - Int. J. Non-Linear Mechanics 2003, v. 39, No. 4, pp. 619-633. Popov V.L. Nanomachinery: a general approach to inducing directed motion at the atomic level. - Tech. Phys. 2002, v. 72, No. 11, pp. 1397-1407. Popov V.L. The Theory of Quasistatic Nanomachines. - Tech. Phys. Lett. 2002, v. 28, No. 5, pp. 385-390. Popov V.L. Quantization of the average velocity of motion in a periodic potential under action of an ultrasonic perturbation. - Tech. Phys. Lett., 2001, v.27, No.7, pp.551-553. Popov V. L. , J. Starcevic, and A. E. Filippov. Reconstruction of potential from dynamic experiments. - Phys. Rev. E, 2007, v.75, 066104 (6 pp). Filippov A. E. and V. L. Popov. Fractal Tomlinson model for mesoscopic friction: From microscopic velocity-dependent damping to macroscopic Coulomb friction. - Physical Review E, 2007, v. 75, 027103. Dudko O.K., Popov V.L., Putzar G. Tribospectroscopy of Randomly Rough Surfaces. - Tribology International, 2006, v.39, No. 5, pp.456-460. Popov V.L., Starcevic J. Tribospectroscopical investigation of a couple steel - steel. - Tech. Phys.Lett. 2005, v. 31, No. 7, pp. 86-90. Popov V.L., Psakhie S.G. Physical nature and properties of dynamic surface layers in friction. - Tribology International, 2006, v.39, No. 5, pp.426-430. Dmitriev A.I., Popov V.L., Psakhie S.G. Simulation of surface topography with the method of movable cellular automata. - Tribology International, 2006, v.39, No. 5, pp.444-449. Schargott M., Popov V. Diffusion as a model of formation and development of surface topography. - Tribology International, 2006, v.39, No. 5, pp.431-436. Böhmer A., Knothe K., Popov V.L. "Von der Schlauheit des Materials" oder Rollkontaktermüdungsschäden ("On the cleverness of Material" or Rolling Contact Fatigue). – ZEVrail, 2006, v. 130, No. 3, pp. 122-127. Bucher F., Dmitriev A.I., Ertz M., Knothe K., Popov V.L., Psakhie S.G. and Shilko E.V. Multiscale simulation of dry friction in wheel/rail contact. - Wear, 2006, v. 261, 874–884. Schargott M., V L Popov, A I Dmitriev & S G Psakhie. Development of surface topography for the rail-wheel contact. - Proceedings of the 7th International Conference on Contact Mechanics and Wear of Rail/Wheel Systems, Brisbane, Australia, September 2006, Vol.1, pp. 49-55. Thomas Geike, Valentin L. Popov. Ein dynamisches Schichtenmodell der Reibung zwischen Festkörpern mit rauen Oberflächen. Tribologie und Schmierungstechnik 2006, v. 53 (1), pp. 5-9. Schargott M., Popov V.L. Mechanismen von Stick-Slip- und Losbrechinstabilitäten. - Tribologie und Schmierungstechnik – 2004, Heft 5, S. 9-15. Popov V.L., Psakhie S.G., Dmitriev A.I., Shilko E. Quasi-fluid nano-layers at the interface between rubbing bodies: Simulation by movable cellular automata. - Wear, 2003, v.254, No.9, pp.901-906. 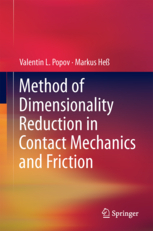 Popov V.L., Psakhie S.G., Dmitriev A.I., Shilko E. Mikro- und Nanoskala-Simulations of Friction and Wear in Combustion Engines and Rail-Weel-Contacts. - In: Reibung, Schmierung und Verschleiss. Forschung und praktische Anwendungen. Tribologie-Fachtagung 2002, 23.-25. September 2002, Goettingen, Band 1, S. 33/1-33/7. Popov V.L., Psakhie S.G., Gerve A et.al. Wear in combustion engines: experiment and simulation by the method of Movable Cellular Automata. - Physical Mesomechanics, 2001, v. 4, No. 4, pp. 73-83. Panin V., Kolubaev A., Tarasov S. and Popov V. Subsurface layer formation during sliding friction. - Wear. 2001, Vol. 249/10-11. pp.860-867. Popov V.L. Scherschmelzen von dünnen Schmierungsschichten zwischen festen Körpern: Thermodynamik und Kinetik. - Tribologie und Schmierungstechnik – 2001, No.3, S.44-48. Popov V.L. Thermodynamics and Kinetics of Shear-Induced Melting of a thin lubrication film confined between solids. – Technical Physics, 2001, v. 46, No. 5, pp. 605-615. Popov V.L. Electronic and phononic friction of solids at low temperatures. – Tribology International. 2001, v.34, No.4, pp. 279-288. Popov V.L. A theory of the transition from static to kinetic friction in boundary lubrication layers. – Solid State Commun. v. 115, p. 369-373 (2000). Persson B.N.J. and Popov V.L. On the origin of the transition from slip to stick. - Solid State Commun. 2000, v. 114, pp. 261-266. Popov V.L.. Electronic contribution to sliding friction in normal and superconducting states. - JETP Letters, 1999, 69, Issue 7, pp. 558-561. Popov V.L. Superslipperiness at low temperatures: quantum mechanical aspects of solid state friction. - Phys. Rev. Lett., 1999, v. 83, 1632-1635. Popov V.L. Reibungsfreies Gleiten bei tiefen Temperaturen. (Quantenmechanische Aspekte der Festkörperreibung). - Tribologie und Schmierungstechnik. 1999, No. 5, pp. 28-32. Popov V.L. Electronic and Phononic Mechanisms of Friction in an Atomically Close Contact of Crystalline Solids at Low Temperatures. - Tech. Phys. 2000, v. 45, N.5, pp. 574-583. Popov V.L., Rubzov V. und Kolubaev A.V. Blitztemperaturen bei Reibung in hoch belasteten Reibungspaaren. – Tribologie und Schmierungstechnik, 2000, No. 6, p. 35-38. (PDF - 204 KB). Popov V.L., Kolubaev A.V. Einfluß der Dicke der Tribomutierten Schicht auf den Verschleiß. - Tribologie und Schmierungstechnik, 1999, No.2, pp. 32-35. Popov V.L. Low temperature anomalies in the phonon contribution to the contact friction of elastic solids. - Tech.Phys.Lett. 21 (10) pp.843-844, 1995. Popov V.L. and Kolubaev A.V. Generation of surface waves during external friction of elastic solid bodies.-Tech.Phys.Lett. 21. No. 10, pp.812-814, 1995. Geike T. and Popov V.L. Reduced description of mixed lubrication. - Tribology International, 2008, v. 41, pp. 542-548. Geike T. and V.L. Popov, Mapping of three-dimensional contact problems into one dimension. - Phys. Rev. E., 2007, v. 76, 036710 (5 pp.). GeikeT. and V.L. Popov. Reduction of three-dimensional contact problems to one-dimensional ones. - Tribology International, 2007, v. 40, 924-929. Thomas Geike, Valentin L. Popov. Reduzierte Beschreibung des 3D adhäsiven Kontaktes zwischen rauen Oberflächen. Tribologie und Schmierungstechnik 2006, v. 53 (3), pp. 5-9. Thomas Geike, Theoretische Grundlagen eines schnellen Berechnungsverfahrens für den Kontakt rauer Oberflächen. Dissertation an der Technischen Universität Berlin, 2007. Filippov A.E., Popov V.L., Psakhie S.G., Ruzhich V.V., Shilko E.V. Converting displacement dynamics into creep in block media. - Tech. Phys, Lett., 2006, v. 32, No. 6, pp. 545-549. Popov V.L., Starcevic J. – Effect of vibrations on the laboratory model "earthquake" statistics. – Technical Physics Letters, 2006, v. 32, No. 7, pp. 630-633. Psakhie S.G., Ruzhich V.V., Shilko E.V., Popov V.L., Dimaki A.V., Astafurov S.V., Lopatin V.V. Influence of the state of the inter-block interfaces on the character of local displacements in block-structured media. - Tech. Phys. Lett., 2005, v. 31, No. 16, pp. 80-87. Dobretsov N.L., Psakhie S.G., Ruzhich V.V., Popov V.L., Shil’ko E.V., Granin N.G., Timofeev V.Yu., Astafurov S.V., Dimaki A.V. and Starchevich Ya. Ice cover of Lake Baikal as a model for studying tectonic processes in the Earth's crust. – Doklady Earth Sciences, 2007, v. 413, N. 2, pp. 155-159. Filippov A.E. and Popov V. Flexible tissue with fibres interacting with an adhesive surface: J. Phys. : Condens. Matter 2007, v. 19, 096012 (10pp). Filippov A.E., Popov V.L. To optimal elasticity of adhesives mimicking gecko foot-hairs. - Phys. Lett. A, 2006, v. 358, pp.309-312. Popov V.L. Probabilistic fasteners with parabolic elements: biological system, artificial model and theoretical considerations. - Philosophical Transactions of the Royal Society of London. Series A - Mathematical, Physical and Engineering Sciences. 2002, v. 360, No. 1791, pp. 211-225. Gorb S.N., Beutel R.G., Gorb E.V., Jiao Yu., Kastner V., Niederegger S., Popov V.L., Scherge M., Schwarz U., Vötsch W. Structural Design and Biomechanics of Friction-Based Releasable Attachement Devices in Insects. - Integrative and Comparative Biology, 2002, v. 42, No. 6, pp. 1127-1139. Gorb E.V., Popov V.L., Gorb S.N. Natural hook-and-loop fasteners: anatomy, mechanical properties, and attachement forces of the joint hooks of the Galium aparine fruit. - In: Design and nature. Compar-ing Design in Nature with Science and Engineering. Ed. C.A. Brebbia, L.J. Sucharov, P. Pascolo, WITpress, Southhampton, Boston, 2002, pp. 151-160. Schargott M., V.L. Popov and M. Heß. Macroscopic isotropy of two- and three-dimensional elastic lattice models - Tribology International, 2007, v. 40, 937–941. Popov V.L. and Psakhie S.G. Theoretical principles of modeling elastoplastic media by movable cellular automata method. I. Homogeneous media. - Physical Mesomechanics, 2001, v.4, No. 1, pp. 15-25. (PDF - 372 KB). Ostermeyer G.-P. and Popov V.L. Many particles non-equilibrium interaction potentials in method of meso-particles. - Physical Mesomechanics - 1999, v.2, No.6, pp.33-39. (PDF - 141KB). Ostermeyer G.-P. and Popov V.L. Solid–Liquid Transition Described by the Particle Method. - Tech. Phys. Lett. 2000, v. 26, No. 3, pp. 250-253. Ostermeyer G.-P. and Popov V.L. Temperature and shear-induced solid-liquid transition described by the method of meso-particles. - Physical Mesomechanics, 2000, n.5 p. 33-37. Popov V.L., Kröner E. Theory of elastoplastic media with mesostructure.- Theor.Appl. Fract. Mech., 2001, v.37, No. 1-3, 299-310. Popov V. and Kröner E. On the Dynamic Theory of Elastoplastic Medium with Microstructure. - Computational Materials Science - 1999, v. 6 (1-4), pp. 218-236. Popov V.L. Thermomechanical model of crystalline elastoplastic media.–Tech. Phys. Lett. , 1999, v. 24, No.3, pp. 815-818. Popov V.L. and Kröner E. Continuum Dynamic Theory of Elastoplastic Medium with Microstructure. - In: Continuum Models and Discrete Systems (CMDS9), Proceedings of the 9th International Symposium, June 29-July 3, 1998, Istanbul, Turkey, 1998, World Scientific Publishing Co, pp. 503-510. V.E.Panin, V.Ye. Egorushkin, P.V.Makarov. Yu.V.Grinyaev, V.L.Popov et. al. Physical mesomechanics of Heterogeneous Media and Computer-Aided Design of Materials. Ed. V.E. Panin. Cambridge International Science Publishing, Cambridge (UK) 1998, 440 p.
Popov V.L. and Panin V.E. Fractal behavior and scaling for disclination structure in a deformable solid. - Physics-Doclady, 1997, 42, No.1, pp.28-30. Popov V.L. The dynamics of quantum crystals at low temperatures. - Tech Phys. Lett. 22 (7), 1996, p.520-522. Popov V.L. Auto waves in an elastoplastic medium with an S-shaped plastic flow law. - Tech Phys. Lett. 21 (1), 1995, p.83-85. Popov V.L. Wave propagation in thin rods. - Russian Physics Joumal, 37, No.6, 1994, p. 546-549. Popov V.L. Relaxation function of elastic-plastic continuum in dynamic gauge theory. - Russian Physics Joumal, 37, No.6, 1994, p. 550-552. Popov V.L. Interrelation of elastic-plastic continuum and Cosserat continuum. - Russian Physics Joumal 37, No.4, 1994, p. 337-342. Popov V.L. A dynamic model of the formation of the surface layer in friction.- Tech.Phys.Lett. 20 (1), 1994 , p.39-40. Popov V.L. Dynamics of plastic rotations in a medium with dislocations and disclinations. - Tech. Phys. Lett., 20 (7), July 1994, p.576-577. Popov V.L. Elastoplastic Behaviour of Crystalline Solids: A Dynamic Gauge Model. - The Physics of Metals and Metallography, 77, No. 3, 1994, pp. 223-232. Popov V.L. Threshold frequency and skin layer effects in the propagation of a stress deviator wave in a crystalline medium with dislocations. - Tech. Phys. Lett. 19 (12), 1993, p. 768-769. Popov V.L. Dynamics of plastic rotations in crystals. - Tech. Phys. Lett. 19 (7), pp. 466-467, 1993. Popov V.L., Chertova N.V. Gauge theory of "plastically incompressible" elastic-plastic medium. II. Dispersion relations with dissipation. - Int. J. Engng. Sci., 1992, 30, N.3, p.335-340. Popov V.L. Gauge theory of "plastically incompressible" elastic-plastic medium. I. Dispersion relations and propagation of perturbations without dissipation.- Int.J.Engng. Sci., 1992, 30, N.3, p.329-334. Popov V.L., Tshertova N.V. Gauge theory of wave propagation in elastic-plastic media. - Russian Physics Joumal, 1992, N.4, p.365- 375. Popov V.L. Phenomenological model of shape memory alloys with two component order parameter. - Tech. Phys. 41 (11), pp. 1109-1116, 1996. Popov V.L. and Kolubaev A.V. Characteristic length parameter determining the formation of the microstructure at great plastic deformations. - Tech Phys. Lett. 22 (7), 1996, p.535-537. Popov V.L. Scale invariance of the disclination structure of materials in an extremely deformed state. - Tech Phys. Lett. 22 (7), 1996, p.544-545. Popov L.Ye, Kovalevskaya T.A., Koneva N.A. and Popov V.L. Influence of random particies of a second phase on the work hardening parameters of intermetallic compound Ni3Al. - Physics of Metals and Metallography, 47, No.2, pp. 148-154, 1979. Popov L.E., Sharkeyev Yu.P., Koneva N.A., Yesipenko V.F., Popov V.L. and Kozlov E.V. Relation between dislocation buidup rate and mean length of slip lines. - Physics of Metals and Metallography, v.43, No.6, pp. 140-147, 1977. Beneslavsky S.D., Bogdanov E.V., Fleyshman L.S., Manankov V.M. and Popov V.L. Resonances of interband impact ionization in narrowgap semiconductors in a quantizing magnetic field. - Semicond. Sci. & Technology, 7, No. 1, pp. 109-118, 1992. Beneslavsky S.D., Bogdanov E.V., Manankov V.M., Popov V.L. and Fleyshman L.S. Resonances of interband impact ionisation in semiconductors in quantizing magnetic fields. - JETP. 71 (5), pp. 1005-1012, 1990. Bogdanov E.V., Fleyshman L.S. and Popov V.L. Electrical breakdown in crossed fields. - Sov. Phys. Semicond. 19 (11), pp. 11 89-1192, 1985. Bogdanov E.V., Brandt N.B., Fleyshman L.S. and Popov V.L. Avalanch breakdown in narrowgap semiconductors in crossed fields. - Solid State Communications, 53, 947-952, 1985. Popov V.L. Mechanism of S-type current-voltage characteristics of narrow-gap semiconductors. - Sov.Phys. Solid State, 25 (7), pp.1223-1227, 1983.